Vince Lomabardi once said, "Practice does not make perfect. Only perfect practice makes perfect." When applied to triathlon training, you might ask yourself, "Am I preparing myself to race my best? Am I doing workouts in practice that train my mind and body for race conditions?" The following, by category, are race simulation workouts you might consider using to get race ready. So you have a goal time in mind for your swim split, right? Have you practiced that pace? Try the following workout to not only test the reality of your goal but also to remind your body what it will feel like. Determine race pace: If you want to do a 1000 meter swim in 15 minutes, your pace/100m will be 90 seconds. The following will be done at the 90 second pace. We call this "T-pace" for time trial or threshold. 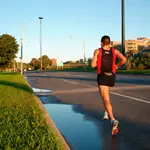 The goal of the workout is to maintain an even pace even as the distances increase. If possible, try to make the last 4 x 100's faster than the first set...as if you are coming "home" stronger than you went out. Main Set: 4 x 100 at T-pace (10 second rest), 2 x 200 (15 second rest), 1 x 400 (20 second rest), 2 x 200 (15 second rest), 4 x 100 (10 second rest). How many of us go to a race never having ridden the course? RIDE THE COURSE! Get a feel for the curves and hills and pavement. Are there any pot holes or tight turns? Where are good places and bad places to pass? Practice accelerating from the bike mount line. Practice attacking the hills (mentally and physically) and maneuvering safely during the downhills. For 30 minutes, your partner will throw in random surges that force you to pick it up for 30 seconds to 1 minute at a time in order to keep up. The entire 30 minutes should be done at just below race pace. One of the best ways to simulate running at the end of a triathlon is to practice running fast on tired legs. At the end of your long run, try to finish the last 10 percent of it at race pace or 20 seconds slower than your goal pace. For example, if your goal is to run your 10K in your next Olympic distance triathlon in 44 minutes, shoot to run your last 9 minutes of your 90-minute run around 7 minute pace. After adequately warming up and stretching, run one mile at hard effort, RPE (Rate of Perceived Exertion) 7-8/10, 5K race pace. Then run 2 x 800 or 4 x 400 at the same pace.